Kathy and I took a short trip to San Diego this week, as a little vacation during the start of her spring break. We rode the train down on Sunday afternoon, spend three nights at the Hilton Gaslamp, and then took the train back up here Wednesday. 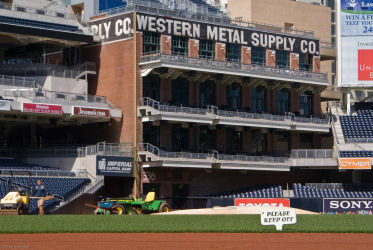 A highlight of the trip was the tour we took of Petco Park, the Padres stadium. It's a great park, and it was fun to get to see views from all different angles. The shot above was taken from the home dugout. More photos from the ballpark and the USS Midway in this flickr set.